JetBlue has become the first airline to accept Apple Pay in-flight, allowing passengers with an iPhone 6 or 6 Plus to purchase food, drinks and onboard amenities, as well as upgrade to available premium seats, all without using their credit cards, according to a USA Today report. The service will begin next week, and will be immediately available to those traveling on transcontinental flights between JFK and airports in San Francisco and Los Angeles, with additional flights to be added next month, and all JetBlue flights to support the service by the month of June. 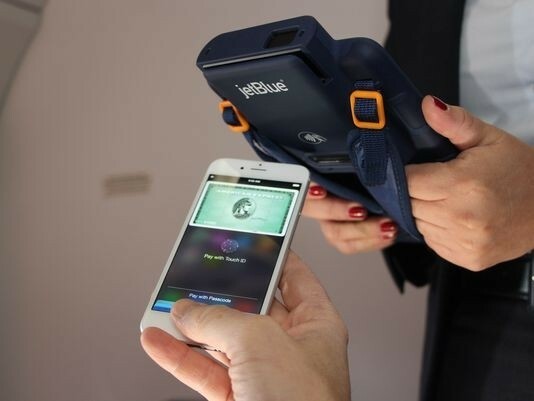 JetBlue's flight crew will carry specially outfitted iPad Minis with NFC-capable cases already approved by the Federal Aviation Administration -- the devices will accept both Apple Pay as well as credit cards. Later this year, passengers will also be able to use the service to complete purchases through the airlines' own mobile app. The report also notes that the upcoming Apple Watch, which is slated for an April release, will also work with the system. With JetBlue becoming the first airline to accept Apple Pay, others are likely to follow suit. "Somebody else doing it always puts pressure on the other guy," said Eddy Cue, Apple's senior vice president for Internet software and services. When asked about plans to expand the service to other areas like subways and public transportation, Cue said "those things tend to move slower than you and I would like. But it's clear you'll see more and more of those, but on a very regional basis," adding that the ultimate goal is to replace the wallet.